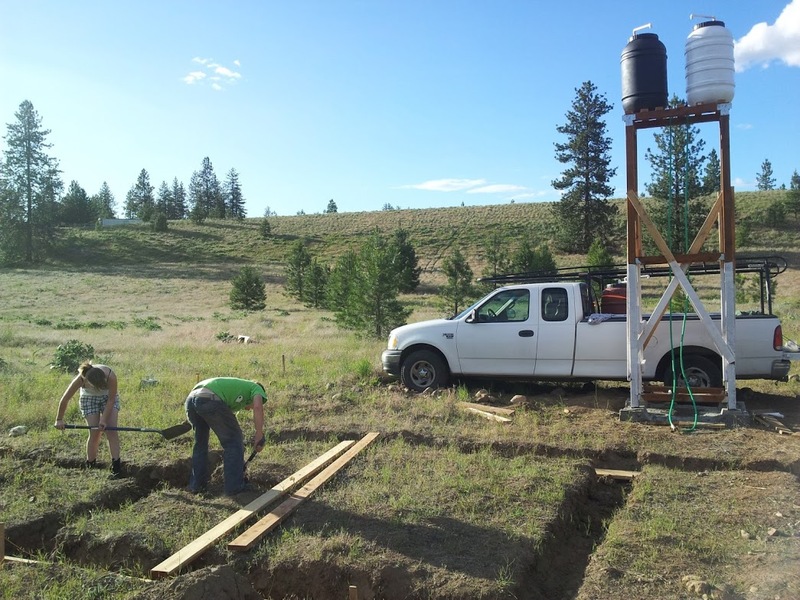 Building anything off-grid is difficult. Here’s one small example that might help you gauge the difficulty of future projects. 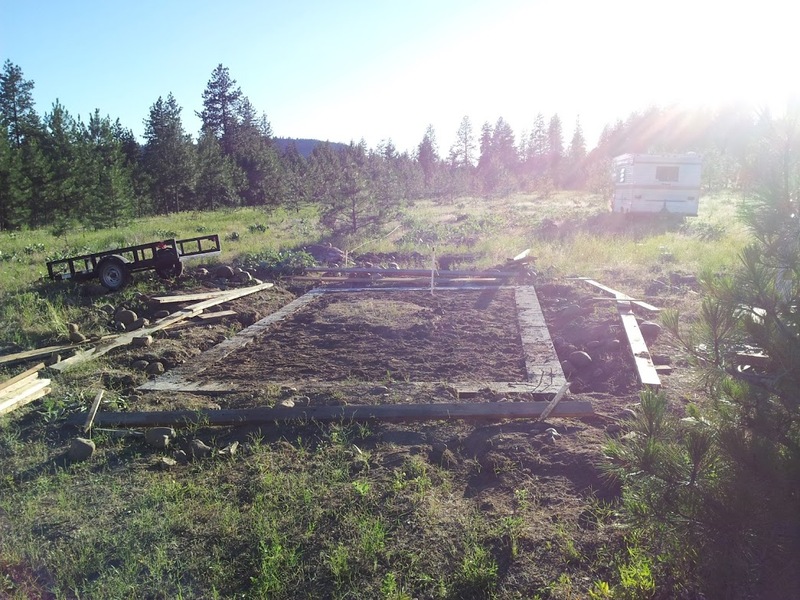 The goal: pour a slab for the outbuilding. The barn is on skids right now. I want it off the soil and on a concrete pad. I’ve never poured a slab before, and this is a perfect practice run. It doesn’t matter if I mess it up–it’s only for an outbuilding. I want to do this for my shop and house, so I might as well do everything as if I were building for something big. This means I’m going to pour a footer and use rebar. The challenge: I can’t find anyone to deliver mix. I have no water, no mixer, no electricity. First, I need to buy a mixer. That’s going to determine the scope of my other needs. At the time, I didn’t find any gas powered mixers that were reasonably priced. I ended up buying an electric mixer. Too bad I don’t have a way to power the mixer. I looked at the motor on the mixer and figured that I would need a 5kW generator. I caught a sale at Lowes a couple weeks later and picked up a generator that can provide 110 and 220 power at a little over 5k. Here’s a generator tip: If your generator doesn’t seem to be providing enough power, try plugging directly to the generator without an extension cord. Those cheapie extension cords lose a lot of power, especially when they’re really long. 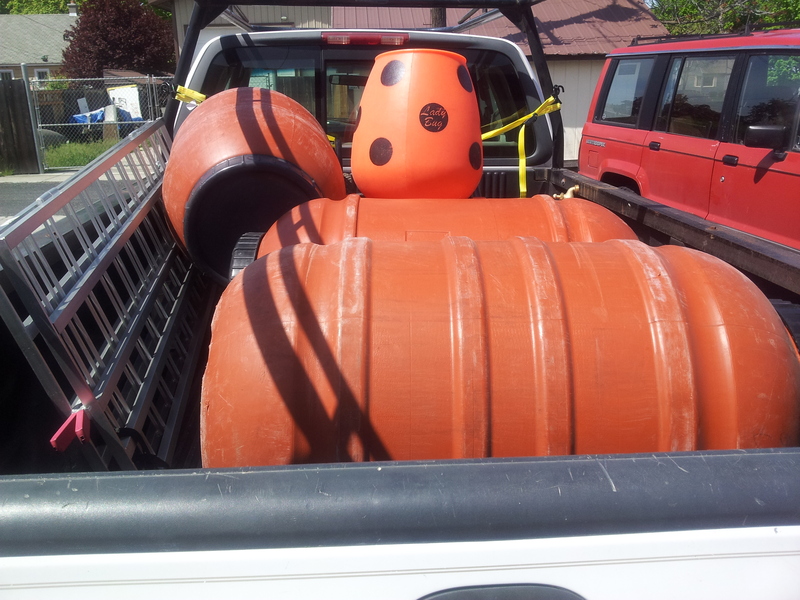 I bought some water barrels to carry and store water onsite. You can see three of the four barrels I bought. I paid a little under $50 for each one. 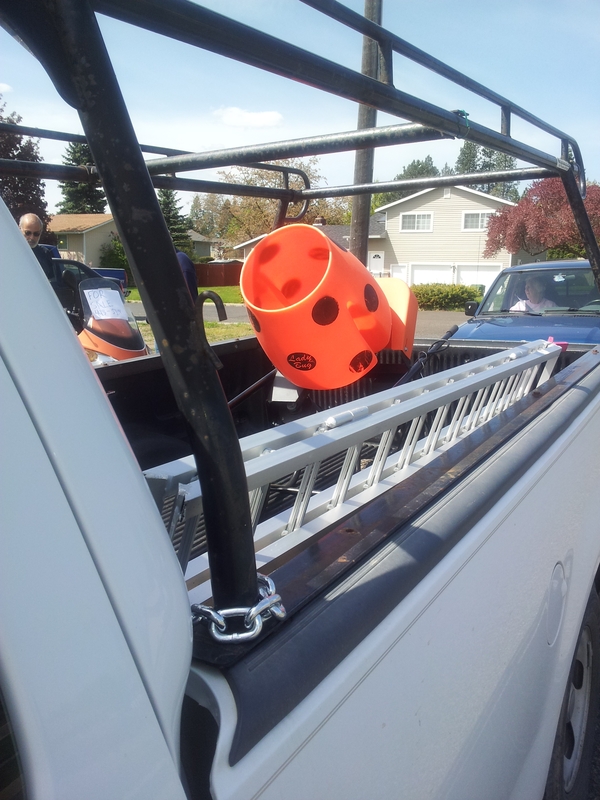 Surplus stores and some outdoor stores carry them. I know I could have cropped the picture, but hey, I like to torture my kids. So, now I had a mixer and water. 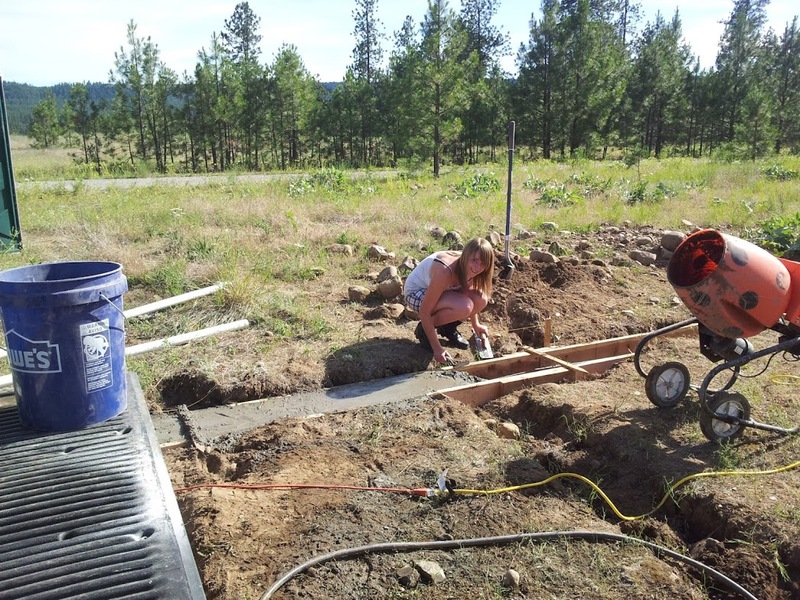 My kids and I were digging out the footing for the slab. I was buying bags of quikrete. I was using 2 x 6 lumber for forms. Of course 2 x 8 lumber is really 1.5″ by 7.25″. I made my calculations and figured out how much water I needed and how many bags of quikrete. 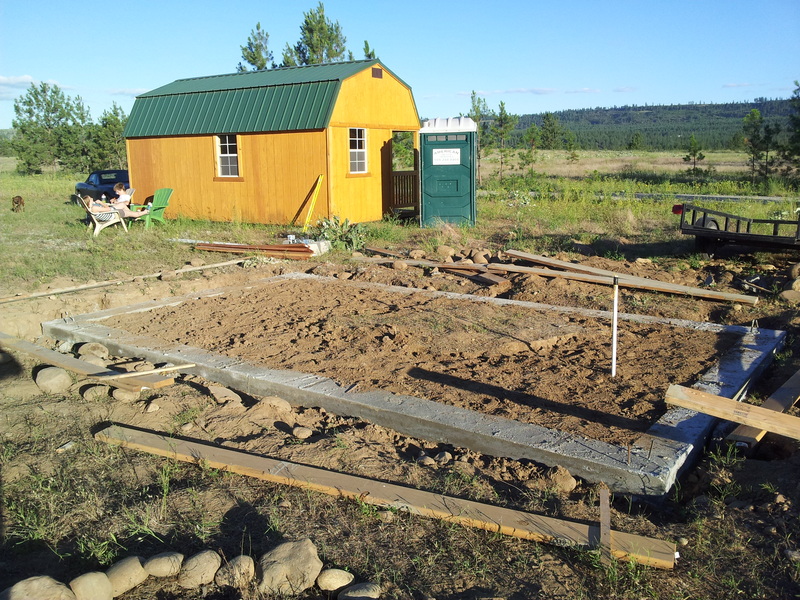 We put in the forms, leveled them and hung rebar as we went. 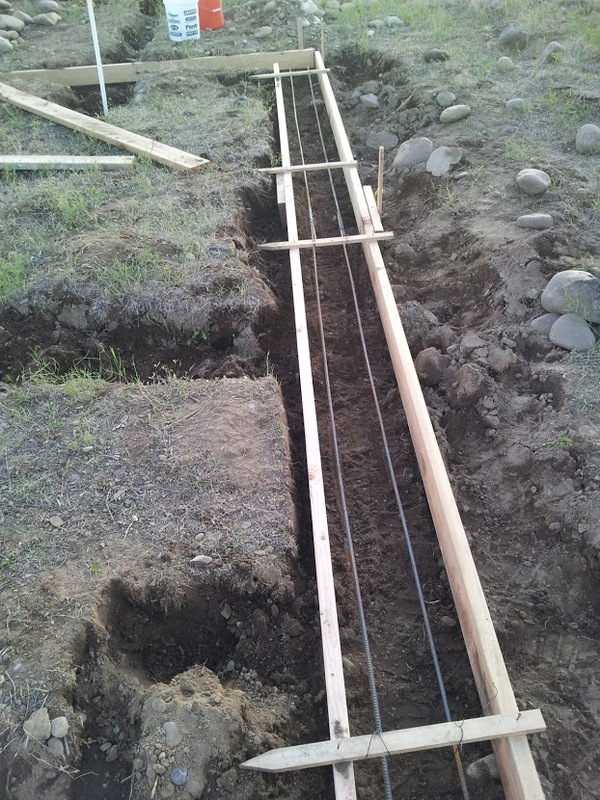 I also put vertical pieces of rebar at intervals to tie the footing to the slab. I admit that I had no idea what I was doing. I recommend you do research before you do things like I did. The pic above shows a piece of PVC sticking from the ground. I made an L shape out of some PVC and a 90 degree fitting. I put some twine through the PVC and buried it. The foot of the L goes beyond the footing and will allow me to pull cable through the slab. Pour Day. The first thing I noticed was that the quikrete was taking a lot more water than expected. We got about three quarters of the pour done before running out of water. I’m not an expert, and I still don’t know how I could have foreseen this. *shrug* I’m glad this was a footing for a small outbuilding and not my house. This was a lesson I learned by doing. We finished the pour the next day. I know that it looks like it slopes. It doesn’t. I was pleased to find not only is it level, but all the corners are true. The next step was to level the ground inside the footer. This was accomplished. Unfortunately, I lost my crew, one going to college and the other to high school. This meant that the pour of the actual slab would have to wait until spring. Since then, I’ve found a company that will deliver. I’m very excited about the prospect of not having to mix concrete. Just a side note: I had a great time with my kids. There were times when I got cranky or they did, but it there were many good times as well. My son took his earnings to school. My daughter purchased a car. The project isn’t done, but I’ve received more value than I could have expected. This entry was posted in Buildings/Structures and tagged cement, concrete, generator, mixer, slab, water tower by admin. Bookmark the permalink.